Companies develop unconventional reservoirs by drilling long horizontal wells and creating hydraulic fractures to allow oil to flow for primary recovery, which currently ranges between 3 to 10 percent of the original oil mass in place. They use commercial software developed based on Darcy's law to forecast oil recovery and reserves. But, in practice, they do not realize that Darcy's law—where flow is based on pressure differences—may not be appropriate for shale reservoirs, the researchers say. After primary recovery, Emami said the existing industry practice is to use a conventional gas injection technique known as "huff 'n' puff" that improves oil mobility and increases recovery. During the "huff," the well and fractures are filled with a high-pressure gas, such as carbon dioxide or methane, which is followed by a short "soaking" period where the well is shut. The well is then opened during the "puff" to allow oil to be produced. However, this conventional technique works poorly for shale formations, researchers say, because diffusion—not pressure differences—is what principally aids oil recovery in these formations containing nanometer-sized pores. Emami said further gains could be made if focus is placed on improving transport caused primarily by diffusion instead of pressure differences. 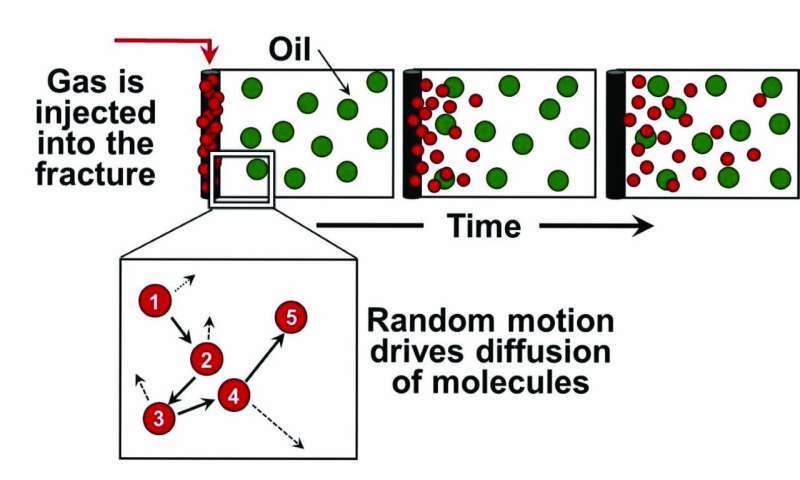 Researchers are working to create experiments allowing them to calculate contributions of convection—pressure differences—and diffusion—concentration differences—independently, and also on methods to accelerate the diffusion process. "However, this conventional technique works poorly for shale formations, researchers say, because diffusion—not pressure differences—is what principally aids oil recovery in these formations containing nanometer-sized pores." Have this described in a recent monograph called Mathematical GeoEnergy. The rapid decline of fracked oil wells has all the indications of a diffusional process. We used an Ornstein-Uhlenbeck diffusional model (well known to condensed-matter physicists) to model fracked well production and can apply this to estimate long-term production levels in places such as the Bakken and Permian. The latter was the topic of a presentation we did at last month's American Geophysical Union meeting in Washington DC. This is all important work as fracked oil is almost a last gasp as a source of high-quality crude oil.